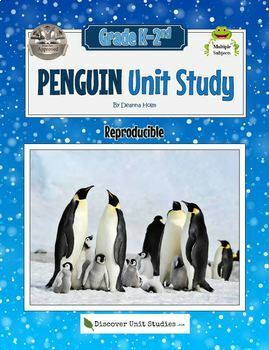 Learn all about penguins with this penguin unit study. 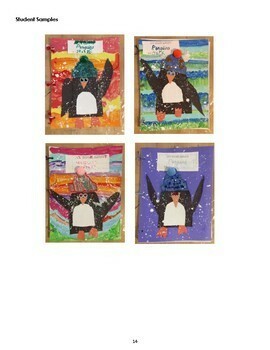 This is an all-in-one book that includes teacher instructions and the reproducible student pages. 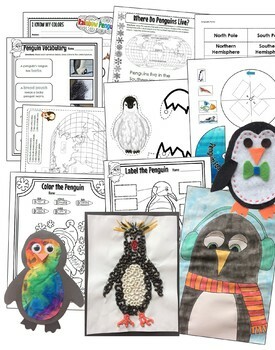 Inside you will find many fun and engaging projects that cover all subject areas. 359 pages. For grades K-2nd. This unit study contains step by step directions for each lesson. The lessons are organized by subject. You can build your own lesson plan or use the daily schedule in the back of the book where you will find 30 days of lessons that have all of the activities planned out for you. If you do 3 days a week this curriculum will take you 7.5 weeks to complete. If you do 5 days a week this curriculum will take you 6 weeks to complete. Reading & Writing Levels There can be a big difference in reading and writing skills for students in k-2nd grade which is why I have create two varieties of worksheets for all the lessons where this was applicable. There are worksheets for students who are not quite writing on their own and need words to trace and copy and there are worksheets for kids who need more of a challenge. 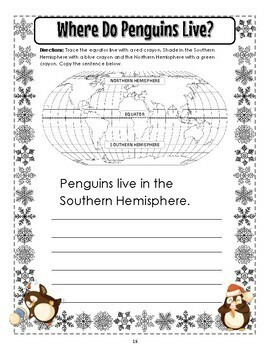 Penguin Geography, 17 Kinds of Penguins, Label the Penguin, Penguin Incubation, Penguin Food Chain, What Do Penguins Eat?, How Do Penguins Stay Dry?, How Do Penguins Stay Warm?, Iceberg STEM Challenge, Polar Bears, Continents, Geography Terms, Penguin Comparison, I Know My Colors, Penguin Vocabulary, Penguin Literacy, Penguin Arts & Crafts, Learn to read with CVC words, Beginning Sound and Middle Sound Games, Letter Sound Review, Blends, Clusters, Digraphs, Penguin Math, Penguin Literature, Penguin Writing & Copywork, and more!